Tailored for quick reading and easy application, How to Interview, Hire, and Retain High-Quality New Teachers, guides principals through the entire hiring process. 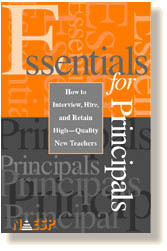 This is the first in a continuing series of publications designed to maximize the principal's time and effort.  Why the hiring process is just the beginning. National Association of Elementary School Principals, 1615 Duke Street, Alexandria, VA 22314. Tel: 703-684-3345; Fax: 800-396-2377.